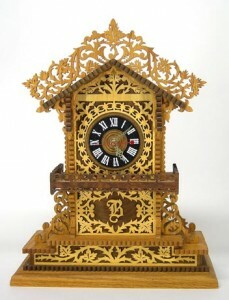 Includes battery-operated cuckoo clock movement, 4-⅜” dia. 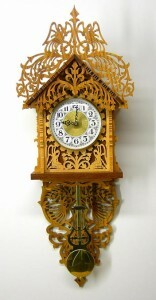 wooden cuckoo dial, hands, screw eyes, brass pendulum stick and bob, hinges, screws, latch hook and brass escutcheon pins. 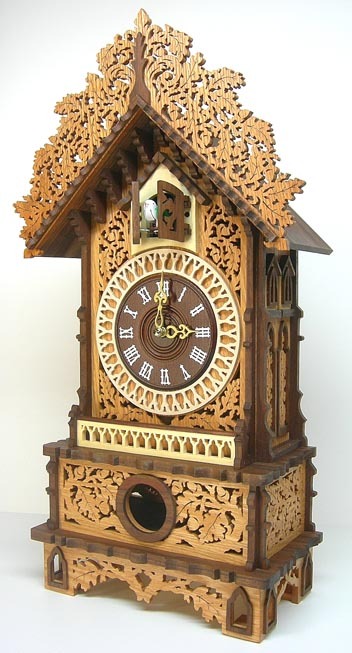 Cuckoo bird pops open the doors and counts out the hours, with an echo and sounds of a babbling brook in the background. Equipped with automatic night silencer, and a switch to control volume to high, low or off, if desired. NOTE: This package includes clock parts and hardware only. The pattern/plan for the Marshall Cuckoo Clock is sold separately.